Wait, Harry Reid Can Ignore Holds? Why does the Senate majority leader let senators’ holds kill some nominations, but not others? This afternoon, Senate Majority Leader Harry Reid made big news by announcing he would not honor any hold placed on Chuck Hagel’s nomination for secretary of defense—a response to Senator Lindsey Graham’s announcement on Sunday he would indeed place a hold on the nomination until the administration answered questions about its response to the embassy attack in Benghazi, Libya. The White House last week withdrew the nomination of Scott C. Doney of Massachusetts to be chief scientist of the National Oceanic and Atmospheric Administration, a little over a year after Sen. David Vitter, R-La., placed a hold on Doney’s nomination, demanding that the Obama administration send Carol Browner, then the White House energy and climate czar, and Steve Black, counselor to Interior Secretary Ken Salazar, to the Hill to defend the “scientific integrity” of the administration’s drilling moratorium and slowdown in permitting. Similarly, and around the same time, Obama’s nominee for assistant secretary for Fish, Wildlife and Parks also fell victim to a hold, again placed by Vitter—this time, he was angry about paltry drilling licenses for the Gulf of Mexico. Implicit in the practice is that a Senator will object to taking up a bill or nomination on which he or she has placed a hold. The Senate’s majority leader, who exercises primary responsibility for determining the chamber’s agenda, traditionally in consultation with the minority leader, is the final arbiter as to whether and for how long he will honor a hold placed by a Member or group of lawmakers. So why did Reid ignore the hold on Hagel, and not the others? One reason might be that the hold came without a real filibuster threat. Hagel reportedly has enough voted to defeat a filibuster, whereas perhaps the other nominees didn’t. Another reason Reid might have allowed holds to kill previous nominations is that, in general, Reid simply believes in Senate comity even when it’s not being shown to him. In a 2010 post on Senate holds, Jonathan Bernstein explained that they are tolerated because “all Senators have an interest in the ability of each Senator to have individual influence.” Plus, it allows Reid to better manage the floor by not wasting time on nominations or bills that won’t succeed. So Reid’s default is to let the holds stand, but this time was just too far. The key question here is whether this was a one-time move by Reid, because of the exceptionally rare (and unfounded) nature of Graham’s threatened hold, or whether this represents a new, get-tough approach to Republican obstruction. I contacted Reid’s office, but it did not respond. In a way it’s sort of academic—since there was no real filibuster reform, holds will live on. 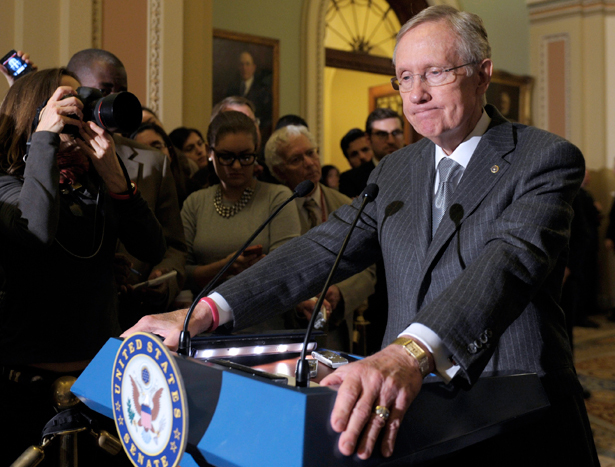 It’s just a sign to Reid that he ought not to bother with even trying to schedule a vote. But if he wasn’t going to make the GOP actually filibuster, nor make them come up with forty-one votes to proceed, as reformers wanted—the least he could do is say “screw your holds,” as he did today. Bernstein, again in 2010, made a persuasive case that at the very least holds on judicial nominations should be summarily ignored. Although he might ignore a Republican hold, Harry Reid won’t be able to ignore Republican filibusters so easily, since he inexplicably capitulated on filibuster reform.